For some reason, I can't think of anything more peaceful, than sitting on a creaking porch swing. ..there's no fuss on the front porch that I want. Just an old, rickety wooden floor, and a swing. No fluffing needed, though it does set the stage for a dinner on the porch, or a place to host company. 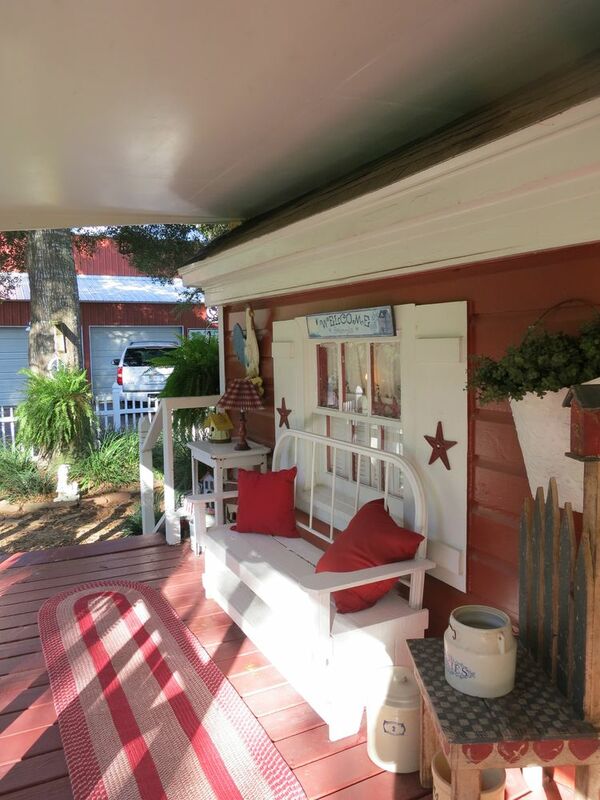 This porch that Tina (from Cherry Hill Cottage) shared is her sister's porch. I love all of the different sitting areas she offers.. and the blue ceiling! So homey! 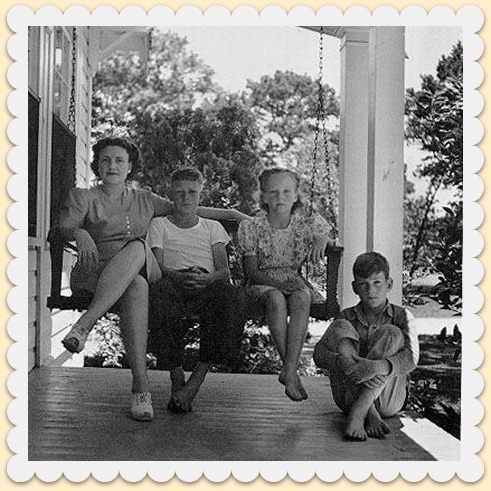 A porch was originally created for summertime, when the temps were hot, and air conditioning wasn't available. It was really a room on the home... open, and breezy. Since it is an addition to your home, it's ideal to carry the style of your interior decor, architecture, etc. onto your porch. Tina's sister lives in a farmhouse, so the country setting that she's designed is perfect for continuity in her home. This, bungalow porch is styled perfectly for that type of home (in my humble opinion). Although it's not my style, I think the furniture and decor suit the home. The lines of the furniture resemble the architectural style of a bungalow. 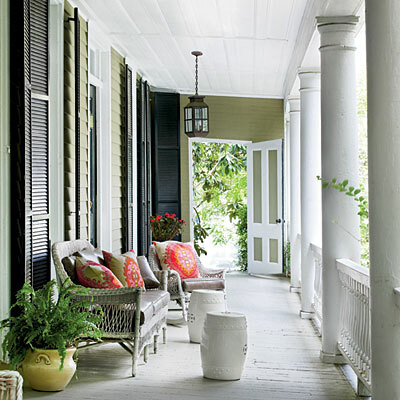 Another example of keeping with the style of the home is this classic Charleston porch... Wicker is almost always seen on large, plantation home porches. Perhaps its tradition, but I think it's beautiful! 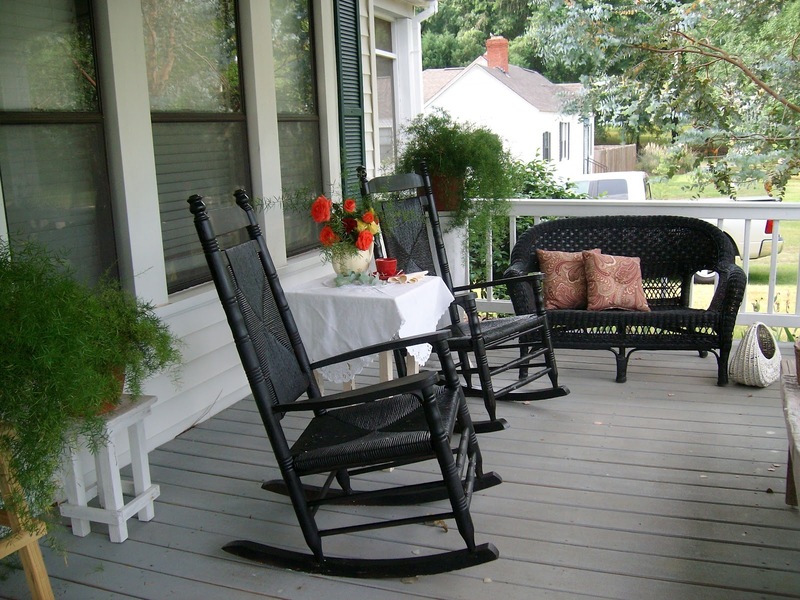 Two things that are staples on a southern porch are ferns and rocking chairs... oh, honey! 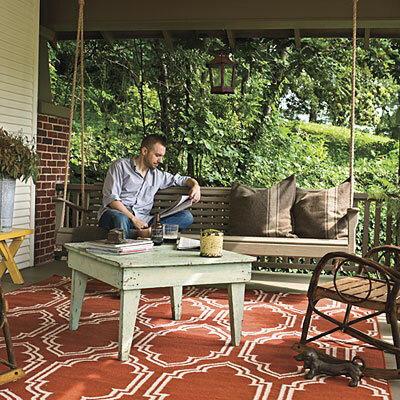 A fabulous example of mixing the traditional southern, simple porch with the wicker found in plantation homes can be found at Jonell's home from Like Gramma's House. See? Rockers, wicker, ferns... a southern girl's dream! 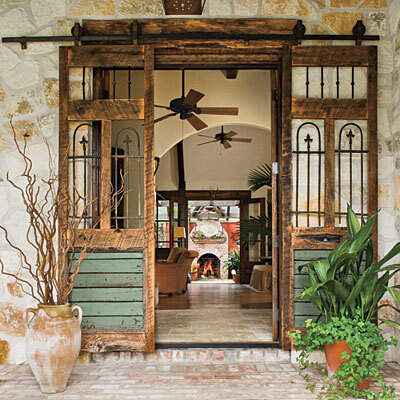 Cute ranch house porch, huh?! 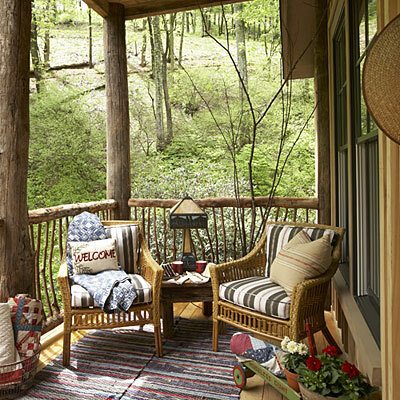 A cabin porch in the woods sounds like a fabulous place for a cup of coffee and a book... doesn't it? 1 - Architecture. It's important that your design compliments the design of your home. 2 - Color. Choose a color that is appealing to the eye - curb appeal is important. 3 - Purpose. Design your space with a purpose in mind. 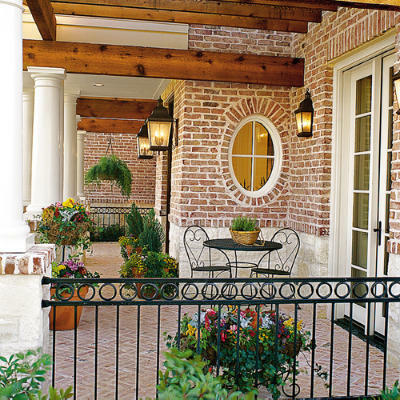 Is it a small space that is only serving as an outdoor landing area for guests to wait for you to open the door? Then maybe a few plants or iron piece is all that's needed. But, if it's a large space that you want to serve meals in and entertain, keep in mind functionality - you'll want a table, sitting area, etc. 4 - Your family. The most important part of a design is that you and your family will enjoy it. If it isn't appealing to you, it'll never feel like a successful design. May I just say: "Ditto" such a wonderful job putting that all together. How do we share this on LGH? I THINK I forgot how. Our plan was actually my husband's Plan..he said he did not want a PORCH WANNABEE.. he didn't want the lightest sprinkle of rain to run us indoors. He wanted to USE that porch and use it we did. So much sharing, praying, planning...enjoying creation and not a few tears the last year or so. We can visit filling both ends of the porch or visit in groups with space between and we can enjoy food drinks or have a tea party which we have done. The basics of the rockers, the ferns and the ferns and seasonally the candle lit lanterns. We told the builder: "We want a Southern, Open and Welcoming Porch " My silver Fox designed the steps with us as old folks in mind. 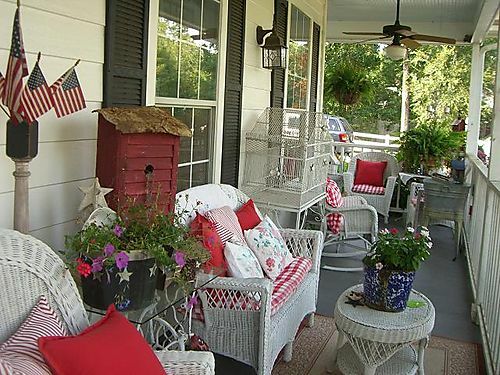 A wonderful porch...it's a Southern thing. I cannot wait to get my front porch ready for spring and summer! 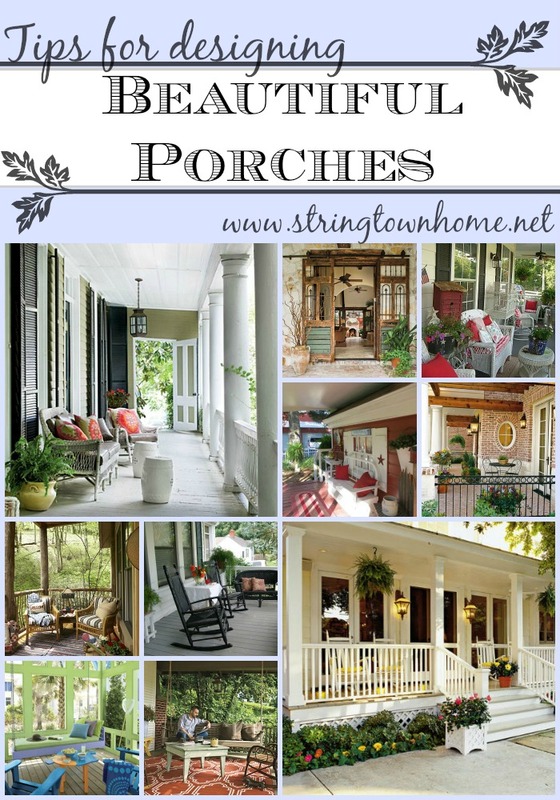 Love those traditional Southern porches!